In the age of the internet, a photograph can be circulated globally in a matter of seconds. With live streaming apps, Snapchat stories and Instagram posts, there are endless ways that fashion moments are shared – and it’s all about unrelenting speed and instant access. In all this, it’s no wonder some are turning to mediums that speak to a slower way of doing things – illustration is one of those rare forms which looks to create an image with longevity, that relies upon delayed gratification. Last month, Instagram invited an influential crowd of illustrators together to celebrate London Fashion Week – here are five of our favourites to hit follow on. Unskilledworker’s atmospheric art is perhaps currently some of the most celebrated on Instagram. They worked with SHOWstudio to create original artworks to coincide with Alexander McQueen’s Savage Beauty exhibition last year at the V&A, have illustrated a Business of Fashion cover, and along with Glen Luchford and Rachel Feinstein, was invited by Gucci’s Alessandro Michele to create a response to his work, to be exhibited at Minsheng Art Museum in Shanghai last year. From global publications to his own magazine Decoy, to the Thames & Hudson book Menswear Illustration, Richard Kilroy’s images have been narrating fashion for a while now. Recently, Kilroy collaborated with ten of London’s foremost designers – from J.W. Anderson to Claire Barrow – on a Star Wars project to raise money for Great Ormond Street Hospital. His marriage of realism and suggested form make Kilroy’s work evocative of a photographed image: something which the illustrator is aiming to contort. As for how she knows a work is finished, she says – “I think it’s an instinctive thing, you just know. 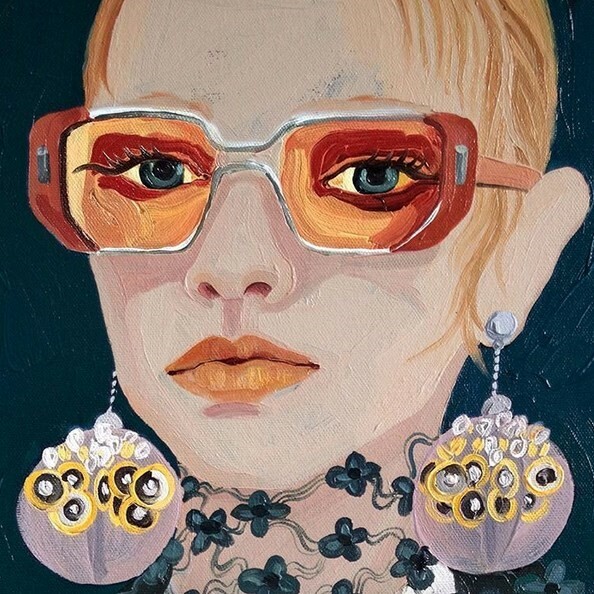 Usually with the fashion illustrations I like to start with block colours and shapes and then start to add in all the finer details, I like it to look as close to the real thing as possible.” Highlights from her feed include her interpretations of the Balenciaga and Gucci runways. Gill Button describes herself first and foremost as an artist. She most recently collaborated on the Dries Van Noten AW16 invites, and has recently come off a two week long solo show at The Bluebird in London. The subjects of her paintings are women who “know what they want”, and “get dressed to do it”.